We all want our hair to shine and preserve its beautiful color. Spring is a good time to change our look and this year came up with a multitude of haircuts and colors combinations. Getting a new haircut with highlights can be a difficult task, especially if you have a long hair. At Plaza Hair Salon, we consider your skin tone, either fair or dark, the texture of your hair and the shape of your face. The color of your eyes is also important. At Plaza Hair Salon we like to keep up with latest tendencies and to inform our clients. 2018 is the year of bold combinations and sophisticated techniques like foil-free, face-framing lightning and babylights. New proposals of the year materialize in either in warm-intimate colors or dark-sultry colors. If you are a brunette or black-haired woman, you may opt for an intense burgundy or midnight blue. If you are a blonde-haired woman, you can pick up one of the variations like rose blonde, buttery blonde, and even cream soda. The heat styling tools, chemicals, and exposures to the sun are the most dangerous enemies of your hair. The deep conditioning hair treatment provides great moisture and fortifies the strands of your hair with protein. We apply the product on your hair. We distribute the conditioner on the whole surface of your hair from the roots to the tips. We rinse your hair with cool water, dry it slowly and style it. Highlight your hair with beautiful tones and make it chic with bangs of any length or thickness. Make its color last with our professional conditioning treatment products at Plaza Hair Salon. You will enjoy its consistency and brilliance throughout the whole year. Call 858.485.7551 or e-mail us at appointment@plazahairsalon.com for your appointment. Walk-ins are always welcome too! 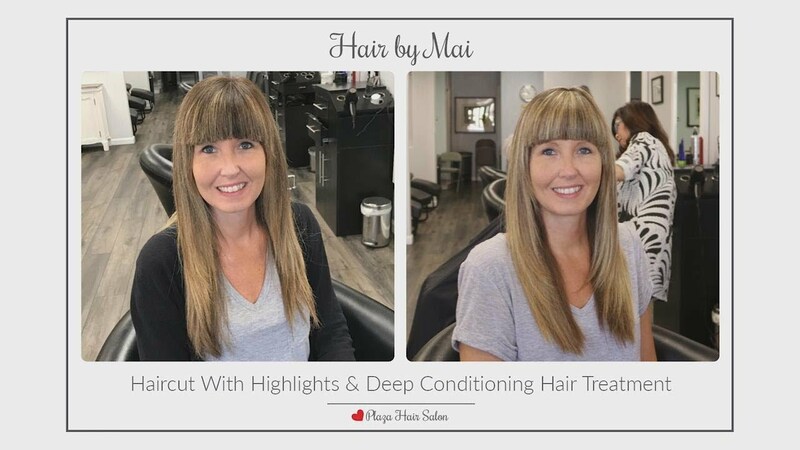 Copyright © 2019 PlazaHairSalon.com. All rights reserved.